Machine for the automatic coil winding construction. Machine particularly adapt where high flexibility and performances are required. The winding flyer and the form axle are numerically controlled; programmable poles divisor and adjustable winding head on vertical and horizontal direction through hand wheel. Established in 1933, the Japanese Corporation TANAC is known as the World's pioneer in the production of coil winders. Since the first coil winder was produced in 1958, TANAC has become the technical criterion for the coil winders. We have gained a remarkable position in the market that is involved in offering Winding Wire Tie Machine. With the assistance of our adroit professionals, we are engaged in manufacturing a wide gamut of Coil Winding Machine. 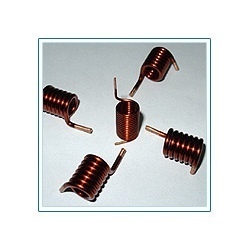 We are offering best quality and wide range of Motor Winding. Capacity: 3 COIL PER MIN. Auto coiler machine is a fully automatic machine. It makes coil from pvc insulated wire/cable. Our clients can avail from us a qualitative range of Wire Winding Machine. These machines are fabricated using quality raw materials in our manufacturing unit. Our range is also checked on various quality parameters to ensure its compliance with international standards.